The Conservative Party should "come clean" about how many members it has, its former chairman has said. 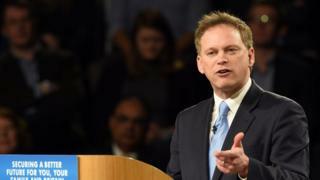 Grant Shapps said "transparency" on membership numbers was vital even if the figure appeared to be "embarrassing". The party last published figures in 2013, when it had 149,800 members but has refused to publish an update since then. Activists and academics have estimated it has fallen to 100,000, or less. That would make the Conservatives the fourth largest party in the UK, behind Labour, the SNP and the Liberal Democrats, according to politics professor and party membership expert Tim Bale, assuming their rivals have "held above 100,000". Labour's membership has surged to more than 500,000 under Jeremy Corbyn and the SNP and Lib Dems have also seen increases in recent years, although the SNP, with an estimated 118,000 members, have slipped back slightly from their post-independence referendum peak. The Conservative Party said it did not comment on membership figures. Mr Shapps said David Cameron had "taken some convincing" to release the figures at the end of 2013. The then Tory leader believed it would be a "difficult and embarrassing figure to publish", said Mr Shapps, who was party chairman at the time. But the Tory MP said he had argued, in a written submission to Mr Cameron, that it would be "embarrassing not to publish the figures and it will help us increase the membership - and it did". Mr Shapps said "coming clean about membership is step number one" in rebuilding the Conservative Party's campaigning strength ahead of the next general election. He said prospective members had to be given a reason to join the party - and he called for them to be given a say in policy formation, as they were in the Lib Dems and Labour. He also argued for the post of party chairman, currently held by Sir Patrick McLoughlin, to be made an elected position. John Strafford, of the Campaign for Conservative Democracy, said he had heard from local party sources that the membership could be as low as 70,000, although a Tory source has told the BBC it is "substantially higher" than that, without saying what it was. Mr Strafford said a full picture would not emerge until March when people had renewed their subscriptions. He said more than half of local associations had fewer than 100 members - and he warned that if nothing was done to make members feel more involved "Labour will wipe the floor with us at the next general election". A post-mortem on the party's 2017 general election campaign, by former cabinet minister, Sir Eric Pickles, called for urgent action to increase membership and the party has said it is "in the process of taking forward his recommendations". Some Tory activists have expressed concern about the party's membership profile, after a report by Tim Bale's Mile End Institute at Queen Mary University of London suggested at least 44% of members were over 65 and 71% were male. But, the report stressed, "none of the parties has got much to write home about when it comes to young people" and "Labour members aren't, on average, that much younger than grassroots Tories". A more worrying issue for the party, it suggested, was that Conservative members appear to be the most disillusioned about how they are treated by their leadership. Just 28% of Conservatives believe they have a significant say on policy compared to three quarters of Lib Dems and SNP members and 61% of Labour members, the survey found. Conservative members "did less on almost every count than their counterparts in other parties" to help their party during last year's general election and the difference was "particularly marked" for use of social media, the report said, which may help to explain Labour's "surprisingly impressive performance". Political parties are under no obligation to publish membership figures - and the Conservatives are not the only party to refuse to do so when the numbers are thought to be falling. UKIP last published a membership figure in July 2016, when it stood at 39,000. According to grassroots website Conservative Home, the Conservative Party's membership may have fallen by a quarter from whatever it was in 2016, caused in part by Tories who voted for Remain in the EU referendum not renewing their subscription. But, the site adds, calculating a membership figure is difficult because the data is held by local party branches and there is not a central register.